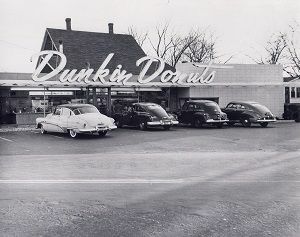 The Open Kettle restaurant in Quincy, Massachusetts becomes the very first “Dunkin’ Donuts” in 1950. The name ties right to our roots as a coffee company. What do you do with a donut? 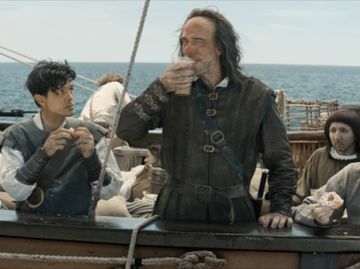 You dunk it in coffee, of course! Dunkin’ Donuts coffee goes international, with the opening of our first overseas restaurant in Japan in 1970. Dunkin’ Donuts is feelin’ the flavors, as we introduce Hazelnut and French Vanilla coffees as companions to our signature Original Blend in 1995. Today, Dunkin’ Donuts offers a complete lineup of delicious iced coffee flavors, including Blueberry, Caramel, Coconut and more. It’s an espresso revolution as Dunkin’ Donuts introduces freshly-brewed espresso, lattes and cappuccinos in 2003. In 2015 we added the Macchiato, a handcrafted, layered beverage made with steamed milk and topped with a double shot of espresso. 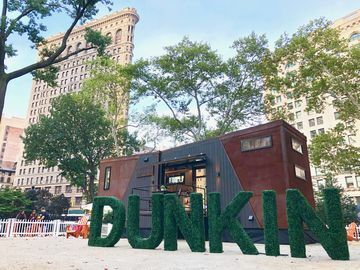 Dunkin’ Donuts coffee now gets served at 35,000 feet, as Dunkin’ Donuts becomes the exclusive coffee provider of JetBlue in 2006, with Dunkin’ Donuts coffee and tea served on-board all JetBlue flights throughout the Americas. At Dunkin’ Donuts restaurants nationwide, Dunkin’ Donuts coffee is available for the first time in single-serve K-Cup pods, for use with Keurig Single-Cup Brewers in 2011. In 2015, Dunkin’ K-Cup pods become available for purchase online and in retail stores throughout U.S. in Canada. Honoring our loyal fans, Dunkin’ Donuts makes it easy to earn free coffee and beverages quickly, launching the DD Perks Rewards program in 2014 to provide guests points towards free beverages with each visit. Free coffee or beverage when you register and on your birthday as well! Rainforest Alliance Certified™ Dark Roast joins Dunkin’ Donuts’ coffee lineup in 2014. Our Dark Roast coffee uses a unique blending and roasting process to bring out key characteristics of different beans, creating a bold flavor and smooth finish without the bitterness typically associated with most dark roasts. 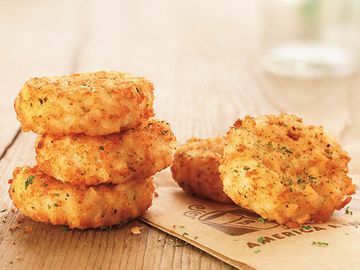 There’s a new non-dairy alternative to milk and cream for guests, as Dunkin’ Donuts restaurants begin to offer Vanilla Almond Breeze Almondmilk as an addition to hot or iced coffee and lattes in 2014. In 2016, we scored a partnership with USA Hockey as the official coffee shop of the U.S. Women’s National Team. In 2016, we make running on Dunkin’ coffee faster and easier than ever, as new On-the-Go Ordering lets DD Perks members order, pay in advance with a swipe of a finger on a smartphone, and then speed past the line in store to pick up their favorite menu items. 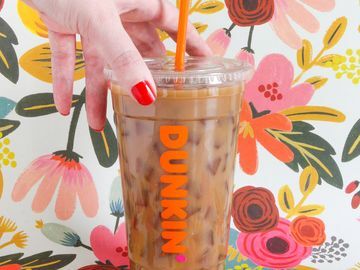 Dunkin’ Donuts crafts an exciting new choice for those who prefer their coffee cold, adding Cold Brew coffee to the menu in 2016. Prepared by steeping a special blend of coffee in cold water over an extended period of time to extract a uniquely distinctive flavor from the beans, the longer brewing process provides a rich, smooth coffee with an inherently sweeter flavor reminiscent of dark chocolate. We hope you will join us this National Coffee Day as we say Cheers to 66 Years. Because after all, our most important coffee moments are those spent serving loyal guests like you each and every day.